Our father married our mother, Beryl Beck, in April 1938, during his second leave. Jean was born in Penang in April 1939 (our parents were living in Bukit Mertajam) and I was born in Johore Bahru in October 1940 (when the family was living in Segamat). Members of the MCS were allowed six months' leave every four years. It was normal for the wife and children to return "home" three months earlier and go back to Malaya three months later in order to benefit from a full year in a healthier climate. In 1941 it was not possible to return to Britain because of the war, so in August our mother, Jean and I, with our Chinese amah, sailed to Australia on the Charon. In Perth our mother found a house to rent and our father joined us in November. News from Malaya soon became serious and our father made arrangements to be flown back to Singapore (by, we assume, the Australian Air Force). He left early on Christmas Day morning. During the next seven weeks he wrote frequently to our mother. The first letter is started at "Some pub or other, Port Headland". They had proceeded in short hops up the west coast of Australia, with tea and sandwiches at Geraldton, down at Carnavon for lunch, tea and biscuits at Onslow, five minutes at Roebourne, and on to Port Headland for the night. "What a Christmas Day, my darling, what a Christmas Day." There is a final paragraph from Darwin, and "I'll probably let you have a line from Surabaya". The next letter is from Singapore, started on December 30. "As you will have heard on the wireless the Japs, realising the importance of my return from leave yesterday, have started on this place." He describes air raid sirens and the sound of bombing, but tries to reassure our mother that the situation is not dangerous. He stays at Raffles for the first couple of days, doing "a special job in the Treasury, very monotonous and boring but urgent and important". "Tomorrow I am going out to live in suburbia. Inevitably when in a few days I am through with my present job I have no idea what I shall be doing, perhaps going right away from Singapore." He mentions "a lot of women folk around who have got away with little more than they are wearing......A good crowd of folk thrown out from their homes, the alerts, a distinct sartorial deterioration (I always wear shorts to the office), everyone doing two jobs, his own and something special.........a most bizarre atmosphere.....it is rather like trying to describe a dream." A day or two later: "Just off to Segamat to get car and clothes. More later. 7.15pm. Not so much later as I had thought - got to the station and found the train is cancelled for tonight so I shall have to go on living in shorts." Soon he is helping with the evacuation of women and children. " It makes me want to shriek with anger or weep to think of all the glorious happiness that men and women can and ought to enjoy and then to see the dull misery caused by war - men nearly dead with fatigue, women nearly cracking under the strain and children terrified of the unknown." "I have vague memories of giving your address to lots of folk whom I didn't know, but anyhow you will be seeing friends. I need not ask you to be kind - but there has been and will be lots of suffering by Malayans." 11th Jan. Segamat. "I am back in my old haunts, staying in Jordan's house. I came up on Friday night to get the car and a bit of barang and here I stay for a bit. There is work to be done here and, with grace, I hope to do it. Don't worry, dearest. If I go out I shall have finished in doing my life's work: if, as the chances overwhelmingly are, I come through safe and sound, you will share my pride in having stood my ground and not run away."....... "But yet, in a queer, perverted sort of way, I am enjoying it, living absolutely keyed up with the whole of one's beautiful settled world crashing around one's ears. Please don't think I am mad..."
17th Jan. "I have the car with some of our possessions, not many alas, and the car still goes, though the ignition is a bit dicky.......I was 8 miles away when our old town got some eggs laid on it the other day. 4 in de B T's garden and one in the bathroom so the house is not quite its old self! But if when the planes come over you lie flat, or better, get into a trench, the danger is very small. I have a queer, but not uninteresting, job, have had 7hrs sleep in the last two nights and got my first food for 22hrs at 11 this morning." Continued on the 18th. "We ought to know soon the result. If it is good, as it will be, there is a man's job to get the country straight again - the destruction is appalling and it is grim to see civilisation falling to pieces.......I am now about to have my second breakfast in ½ hour! 25th Jan. "A pleasant morning in a pleasant house south of Johore." Continued the next day: "This morning we are off out, with the possibility, not to say the hope, of meeting some of our yellow friends, but I would sooner be doing that than crouching in a drain in Singapore with no chance of retaliation. The situation here is pretty grim and Churchill says it will get worse and you may guess what that means." 28th Jan., Singapore. "Busy, very tired, one night bed at four after driving since 9.30, the next night "bed" (on a concrete floor) at two........I can't tell you what I am up to but I have done a few things that might have been useful - and in war you must waste 99% of effort to get success over 1%........I saw Sandy (our dog) not long ago and can only hope that Booth put a bullet through him before he left his place." 7th Feb., Singapore. 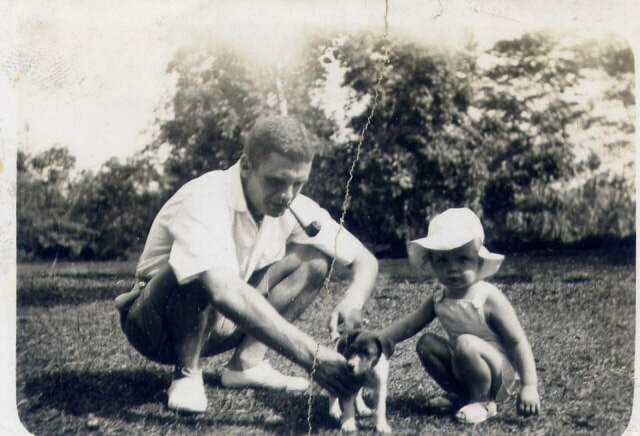 "I can now tell you that when I went up to the old home to collect barang I stayed on doing jobs which my knowledge of the country enabled me to do and all the way back I was on this sort of outdoor jobwork." And a ps: "Just off to my new job. It will enable me to indulge one of my hobbies. Not exactly safe but there is not much safety anywhere on the island these merry days." That was the final letter. After the war our mother was told that at the Fall of Singapore our father had enlisted as stoker on one of the small boats engaged in evacuation work. Quite recently we have learned that our father was on the passenger list of the Mary Rose, a forty-foot motor launch skippered by Captain George Mulock and carrying several officials, including Lt. Col. John Dalley. This suggests that our father may have been working for Dalforce in the final few weeks. In the Banka Straits the Mary Rose was captured by the Japanese and escorted to Muntok Harbour. Those on board were taken prisoner and apparently there was some doubt as to whether our father should be classified as civilian or military. We have now learned of a list compiled in Changi of the whereabouts of prisoners in other camps, on which our father is down as "K G A Dohoo MCS RNVR Palembang". This is the first we have heard of any naval connection - unless the stoker story is true. Anyway, the Japanese decided to classify our father as civilian, and his profession was recorded as Tide Waiter. Apparently a Tide Waiter is an old term for a type of customs officer. In the 1856 Guide to the Civil Service Examinations there is mention of an examination to become a Tidewaiter. So the Japanese translator must have had a rather dated dictionary. Soon our father was moved to Palembang, to the old prison, where the men were mostly Dutch and Indonesian. 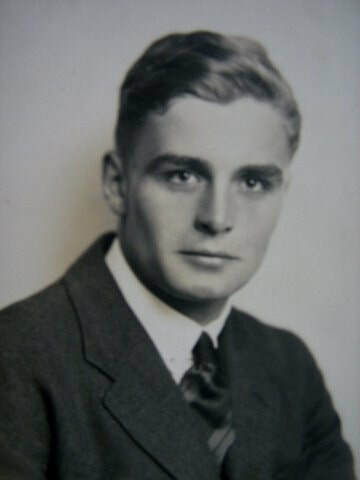 We do not know when or how our mother learned that he was a prisoner, but she received one card from him, sent in March 1943, on which he says he is in the best of health and time is passing quickly. And with the publication in 2007 of the diaries of a fellow prisoner, American journalist William H McDougall Jnr., we now have detailed information about life and conditions in the camp. At Palembang the prisoners organised classes and lectures and morale seems to have been reasonably high. Our father is mentioned in the diaries. 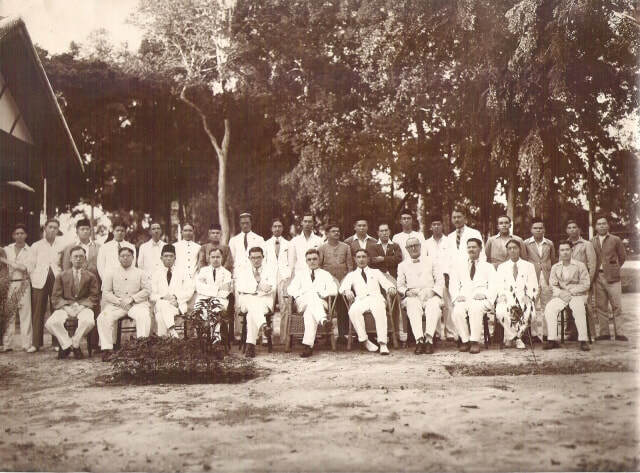 March 26 1943:"Attended my first session of debating society......Next week Malay Civil Service Officer K.G.A.Dohoo proposes "That the privately owned newspaper is an evil that should be eliminated from the state." I will oppose." April 2 1943: "Tonight debated with K.G.A.Dohoo on his resolution which I opposed. Won debate by score 29 to 11. He presented his resolution well, eloquently & without notes." In September 1943 the prisoners were moved to Muntok. The area was infested with malarial mosquitoes, food became even more inadequate, and death rates increased. The camp ran a hospital, there were doctors amongst the prisoners, but no medicines were provided. Enthusiasm for entertainments seems to have waned as the grim struggle for survival took priority over all else. 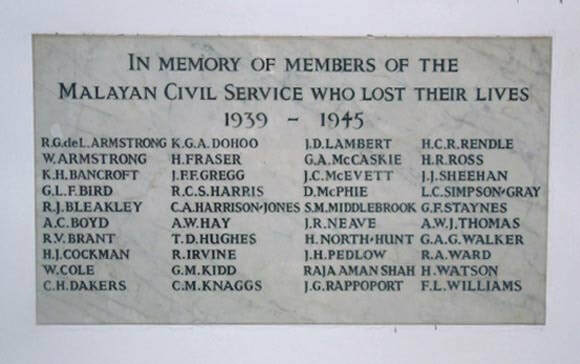 McDougall's diary entry Oct 26 1944: "Last night died four men, including K.G.A.Dohoo, 38, British civil servant in Malaya , a real gentleman & to me personally the most tragic death yet in camp. Dohoo died of malnutrition & malaria - lack of food and lack of quinine, as so many others now are dying daily. His story is the story of the British community here. Bombed, shelled, wounded, sunk in Malacca Straits, swam for life & won, landed & interned penniless, clothesless. Never had a cent except infinitesimal loans in camp, uncomplaining & cheerful, tolerant, cultured - but one of those persons constitutionally inept at almost every practical aspect of living. Completely unable to successfully care for himself. Septic sores & chronic malaria, coupled with malnutrition, sapped his physical reserve until he collapsed a few days ago, was brought into hospital & died. Always active in camp life, always willing to work on many jobs, but never succeeded at any of them. He just couldn't work with his hands without spilling something, or dropping something or burning the rice. But he was (a) man other men loved because he was a genuine gentleman - heart and soul. I was with him when he died at 8.45 p.m. after 24 hours of coma." When the European war was drawing to a close, our mother booked a passage to England on a cargo boat and we sailed home in May 1945, via the Suez Canal. We stayed for a while with our father's parents in London, then went to Devon to our mother's parents. I can remember that we talked about "When Daddy comes home." A few days before V J Day our mother was informed by the Colonial Office of our father's death. When our mother died in November 1992, shortly before her 84th birthday, we found she had left a collection of letters for us to read: letters of condolence she had received, letters our father had written both before he joined us in Australia and after he returned to Malaya and also letters from men in the same camps who had survived the war, with whom she had managed to make contact. With the letters we found her poem. We found a love that never can decay. Possessing all that ever I possessed. And all eternity before us lies. There is no separation even here.